LOS ANGELES, California (CNN) -- Comedian-actress Wanda Sykes kept a big secret as she delivered her controversial speech at the White House Correspondents' Dinner last weekend. 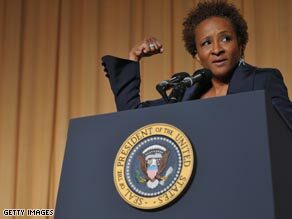 Wanda Sykes speaks at the White House Correspondents Dinner. Sykes' wife Alex gave birth to twins on April 27, her publicist said Wednesday. She announced last November that she is gay and had married Alex a month earlier. The new Sykes tykes are daughter Olivia Lou and son Lucas Claude, spokeswoman Danica Smith said. "All are happy and healthy and at home," Smith said. Sykes, a stand up comedian, currently stars in the CBS sitcom "New Adventures of Old Christine." Her political jokes at the White House dinner jokes drew sharp criticism, especially from conservatives who were her favorite target.